This recipe pairs the classic flavors of shrimp scampi with a bright and hearty plate of pasta. 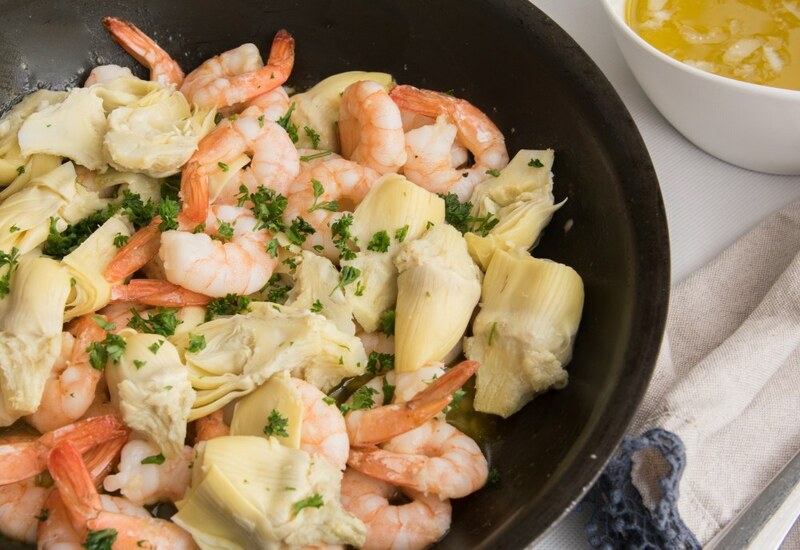 Lemon, garlic, shrimp and the unique addition of artichoke hearts come together in a quick and easy 30-minute meal. The result is a deliciously simple meal that you will certainly wand to add into your weekly repertoire! Don't forget to garnish each serving with a sprinkle of chopped fresh parsley. Parsley brightens up the dish with beautiful color and flavor. Swap out the artichoke for any other vegetable you prefer or is in season. Asparagus, broccoli, olives, or zucchini would work well in place of the artichoke hearts. You can even use chicken instead of shrimp. Top the finished pasta with finely chopped fresh chives instead of the parsley. Customizing recipes is the joy of cooking at home! Per Serving: 421 calories; 22g fat; 29.2g carbohydrates; 26g protein; 191mg cholesterol; 1307mg sodium. This was so simple and delicious. Really fresh tasting and delicious. You can't go wrong with Lemon and Shrimp! Garlicky lemon shrimp and pasta go together like peanut butter and jelly! This recipe has the right amount of flavor and spice. It's also light and simple, a perfect weeknight meal. I added extra shrimp and cheese! Great dish! I love shrimp scampi! This recipe is so good, it should be on a restaurant menu! I added pine nuts for some extra crunch. Overall, delicious, classic dish and the sauce is superb. Super easy! Delicious and filling without being too heavy! I'm obsessed with this! I made this dish using jarred marinated artichoke hearts so I only used half the amount in the recipe. When they're marinated they're a little saltier than in the can. I also tossed in a little spinach to add some green to this pasta. Definitely going to make this again, next time I will use canned artichokes.